(As I pointed out here, in Biblical Hebrew cheres was spelt with a sin חרש, not with the samech found in later Hebrew). This got me thinking - just a drash? Then what is the real story behind charoset? This law has significance to our quest as well, since if charoset was not only used on Pesach, then the etymology would not be associated specifically with something related to Pesach, or slavery in Egypt, and would likely have a more general origin. An even later commentary on the Aruch, the Tosefot HeAruch, by Samuel Kraus, continues Kohut's approach, and quotes the 13th century work, the Or Zarua, who in turn quotes an earlier French rabbi, Samuel of Falaise, who defined charoset as meaning "things that are mixed and squashed", and added that the Aramaic translation of Shaar HaAshpot (literally the "Garbage Gate") in Nechemia 2:13 is תרעא דחרסית - tara'a d'charsit - "gate of potsherds, broken pieces of pottery." (This translation is likely influenced by Yirmiyahu 19:2, which mentions Shaar HaCharsit שער החרסית, and which Rashi and others identify with Shaar HaAshpot). Krauss also mentions Rashi's definition of charsit found in Chullin 88a, as "pulverized pottery" and "crushed tiles" in Bava Kama 69a. The common thread in all of these is a sense of "crushing, grinding, squashing" - and that applies to both charsit and charoset. Ronnie Haffner, of the site Safa Ivrit, suggested to me that perhaps the suffix -et ת- at the end of some Hebrew words means "leftovers after production", so pesolet פסולת - "chips, stone dust" is what is leftover after carving פסל, and nesoret נסורת - "sawdust" is what remains after sawing נסר. So if this pattern holds, charoset could be the potsherds, which are left after breaking pottery. A parallel approach is mentioned by Jastrow, who in his entry for charoset suggests we also look at his definition of the Aramaic הרסנא harsana - "fish hash." He quotes Jacob Levy, who in his dictionary, like Kohut, says that charoset is of Arabic origin. Harsana, according to this theory, derives from the Arabic root harasa - which Klein says is cognate with the Hebrew haras הרס ("throw down, tear down") and means "he crushed, squashed, pounded." This Arabic root is the source of the spice paste "harissa", due to the crushing of the peppers in a mortar. This is an interesting theory, for if charoset is cognate with haras, then it has no connection with clay at all (since we saw that the Biblical Hebrew form of cheres is חרש, which is not connected to הרס.) Kohut's theory, on the other hand, still maintains a connection between broken pottery and charoset. The Ben-Yehuda footnote we saw above rejects both Kohut's and Levy's Arabic etymologies, as "they have no similarity to the thing called charoset." While today's sweet charoset is not like fish-hash or harissa, I don't see why charoset couldn't mean a general type of sauce or condiment, and as we saw above, charoset had uses beyond those on Pesach. includes the information that haroset in Greek is tribou enbamous, written טריבו אנבמוס...tribou would seem to come from the verb tribo to pound or grind, whence the Greek term for a sauce, trimma. Archestratus of Gela, a fourth-century BCE food writer whose work is preserved by Athenaeus, writes of a dipping sauce made by pounding (tripsas). Enbamous would appear to refer to the Greek word embamma, which is used to mean a sauce used as a dip, deriving from the verb embapto, embaptomai to dip. Later in the same passage of Archestratus, the verb embapto is used for dipping into a pounded sauce. In their commentary on this passage, the editors Olson and Sens describe the verb embapto as ‘the vox propria for dipping food in a side-dish sauce or the like.’ Thus Archestratus uses both terms found in the glossary as an explanation of haroset in his instructions to dip (embapte) food into a sauce made of pounded (tripsas) ingredients. is because it is pounded [dukhah]. The Hebrew name dukkeh for haroset has survived to the present day. Jews from the Yemen, cut off for many centuries from the mainstream Jewish community, relied on the Jerusalem Talmud as their religious authority, unlike other Jews, for the Babylonian Talmud did not reach them for many hundreds of years. The Yemenite Jews have preserved the tradition of the Jerusalem Talmud, and to this day the Yemenite Jewish community in Israel still calls haroset ‘dukkeh.’ We may also note here the use of the name dukkeh among Palestinian Arabs for a condiment made of pounded hyssop (za’atar) and sesame seeds. So like dukkeh, while the word charoset is of Hebrew origin, it appears to be a calque, borrowing the Greek concept of a sauce of pounded ingredients. Therefore the association with Pesach should not be surprising, as the seder includes many elements (but with significant differences) of the Greek symposium, as we saw in our discussion of afikoman. And like with the afikoman, later scholars who did not live in the Greek and Roman world were not as familiar with the original concept reinterpreted the word and gave it new meaning. So while the connection between charoset and the cheres used to build the bricks in Egypt is a drash, it is not "merely" a drash. For what is more associated with Pesach than reinterpreting and giving new meaning to ancient foods and concepts? Pesach is coming up and we will be reading from the haggada הגדה. What is the connection between haggada and aggada אגדה - the stories found in rabbinic literature? הפליה אפליה - both meaning "discrimination"
הונאה אונאה - "oppression, deception"
While both words are Hebrew, the words beginning with alef have more of an Aramaic influence. As often happened in Hebrew, when we have two synonymous words, their meanings tend to diverge. So haggada came to be associated almost exclusively with Pesach. In Modern Hebrew, agada has also come to mean "folktale" or "fable", famously in the quote from Herzl (originally in German) - אם תרצו אין זו אגדה - "If you will it, it is no fable [aggada]." And aggadot are used to refer to stories for children. This was cause for opposition by some Haredi writers, who found this secular use showed disrespect for the aggadot of the Rabbis. The verb הגיד higid comes from the root נגד. Klein that the ultimate meaning of this root is "to rise, be high, be conspicuous." So the verb higid, meaning "he made known, announced, declared, told", originally meant "he placed a matter high or made it conspicuous before somebody." This same root gives us the word neged נגד - "opposite", which again originally meant "that which is high or conspicuous." And the term nagid נגיד - "chief, leader, ruler", cognate with the Arabic najid, can also be understood in this light - "noble". Klein points out that the word nasi נשיא had a similar development - literally "one lifted up" from נשא - "to lift." Klein mentions an alternate theory by Barth that nagid originally meant "speaker, spokesman", and perhaps nasi also might have mean "speaker." 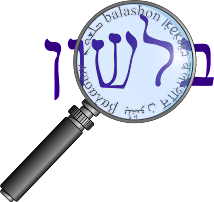 In Modern Hebrew the title nagid is primarily used to for the governor of the Bank of Israel. In Hebrew, the word seret סרט means "ribbon". Let's take a look at the history of the word, and some possible relatives. As Elon Gilad writes here, the word first appears in the Mishna and meant "strip (of fabric)". In 1892, Ben Yehuda revived seret to mean "ribbon", and in the 1920s, it came to mean "film" and "movie", due to the ribbon-like appearance of the film strip. Klein says that sirton סרטון actually means "film strip", but today sirton is used for a short film, particularly a video clip (like the ones shared on social media). Gilad says that seret may "derive from the Greek word sirtis, which means “bolt” (as in locking the door)." This is similar to the suggestion in Ben Yehuda's dictionary that it derives from the Greek syrtēs, meaning "rope", however the dictionary ultimately rejects this idea as unlikely. Note that both "bolt" and "rope" are things that are pulled or dragged. Syrtis today refers to two sandy gulfs in North Africa, called so either due to sandbanks or quicksand. Klein, in his CEDEL, writes that the English word "swerve" is cognate (both originating from the same Indo-European root, *swerbh), also having a similar sense to "trail, drag, sweep away." However, there are other theories regarding the origin of seret. Stahl connects it to the root סרט, or in the Biblical form שרט, both meaning "scratch, scrape." The Arabic cognate also means "to tear", or "to rend one's garments in mourning." He writes that the Arabs would tear leaves and fibers from palm and other trees to make ropes and strips - and this is the origin of the word seret. From this root we get the verb שרטט, "draw, rule, mark lines, sketch" and sirtut שרטוט is "drafting". Another related word is sartan סרטן. It originally meant crab (a scratching animal), which in the zodiac is the sign "Cancer", and as in English later came to mean the disease cancer as well. The connection between the crab and the disease isn't clear - perhaps the hard tumor is similar to a crab shell, or maybe the enlarged veins of a cancerous tumor resembled the legs of a crab. There is a connection between the Hebrew word for face - פרצוף partzuf and the Yiddish word frum, meaning "religiously observant, pious." Let's take a look. Partzuf is a Talmudic word borrowed from the Greek prosopon, meaning either "face" or a mask that covers the face (in Greek it eventually came to mean "person" as well). Hebrew already had the biblical word for face, panim פנים, and so partzuf went through a number of transformations. In Talmudic literature the two words were more or less synonymous, but later in Hebrew it began to take on a negative one. (Panim can be used for the face of any physical object, whereas partzuf is only for a human face). So today partzuf generally has less a positive connotation, and so you might tell a child not to make a face - לעשות פרצופים le'asot partzufim or partzuf atzuv פרצוף עצוב - "sad face". In any case today the sense of "face" is almost always associated with some description, and as such has also come to mean "characterization, personification", and through a process called metonymy, where an attribute is substituted for the thing meant, we have in Israeli slang the use of partzuf without any description to refer to an ugly or negative person. Eizeh partzuf איזה פרצוף - "what a (bad/ugly) guy!" Old English framian "to profit, be helpful, avail, benefit," from fram (adj., adv.) "active, vigorous, bold," originally "going forward," from fram (prep.) "forward; from". Influenced by related Old English fremman "help forward, promote; do, perform, make, accomplish," and Old Norse fremja "to further, execute." Compare German frommen "avail, profit, benefit, be of use." Sense focused in Middle English from "make ready" (mid-13c.) to "prepare timber for building" (late 14c.). Meaning "compose, devise" is first attested 1540s. The German cognate mentioned in that entry, frommen, has a related word in German - fromm, meaning "pious, devout" (via the senses of "good, righteous".) And from here we get the Yiddish word "frum".